Howdy - Lydia here! Today the team is doing a blog hop with Kitchen Sink Stamps. I met Maria (the owner) - years ago in Houston when KSS did a traveling class - it was truly one of the most amazing classes I've ever taken. She is the inventor of what I consider the original multi-step stamps, and her images are amazing, so I'm thrilled to have the chance to hop with this incredibly creative woman and her team. I chose her Cabin by the Lake set because it looked so peaceful. I wanted a non-wintery setting for the cabin, so I decided to create a more summery lake scene, using the Colorbox stylus, foam tips and numerous inks. For the sky, I used pink and yellow, and then added blue on top to make it a nighttime scene, but leaving some pink and yellow shining through. I work with the stylus from the edges of the card in, and to get the best results, you really need to work on glossy cardstock - so happy that we carry this again. For the water, I stamped only the detailed water image from the set in Pacific point, and then used the stylus to add Marina Mist ink over that, as well as Daffodil delight for the reflected sun. All the green inks below are for the ground, and I used the browns for shadows. The cabin was stamped on Whisper White, not glossy, and I cut it out and sponged the edges with early espresso using the stylus, to make sure the edges were in shadow. I love the duck stamps and how they blend in with the water stamp and have their own reflection. The sentiment is from School Days. I love how moody and peaceful it looks. This card is for today's Kitchen Sink Stamps & My Sweet Petunia blog hop and giveaway! 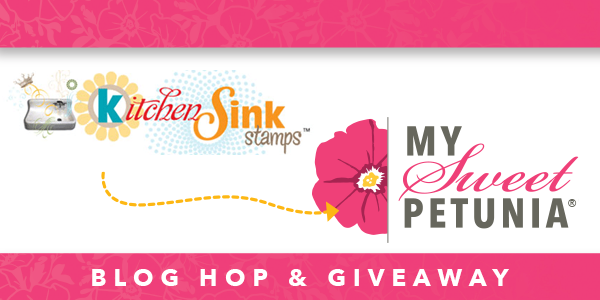 If you comment on every blog in the hop, you will be entered to win one of two prizes: - a mini or original MISTI (winner's choice), and another lucky winner will get a $50 shopping spree at Kitchen Sink Stamps. It just so happens that today - actually this very day - is Kitchen Sink's 10th anniversary! In honor of that, Maria is having a sale - 35% off all in-stock items, with free shipping at $65 and above. Sale excludes out of stock and special order/retired items, and the sale runs from today through 9/29 at midnight Pacific. Use coupon code KSSDECADE to get the sale pricing! So here are the rest of the hoppers - go see what they've done and good luck! Comments close at 11 PM Central time on 10/2 and winners will be announced on the MSP and KSS blogs on October 3rd. I thought I had left a comment for you but am not seeing it so here goes again! I ❤️ ❤️ ❤️ the serene scene that you have created! The layering stamps are my favorite type of stamps these days because they allow those of us who can't make a realistic scene, come to life with coloring, actually do it! Beautiful colors on the peaceful cabin scene. Superb coloring. Your card is quite mesmerizing. This is just a stunning scene you have created Lydia. I love the cabin and the scene looks so serene and peaceful! BTW, did you ever draw for the 2 sets of Creative Corners that you were giving away in Aug. It said you would be drawing after Aug. 18th but I have never seen who won? Just curious. Gorgeous! I am still trying to learn this technique. Love the flexibility of the layered stamping! 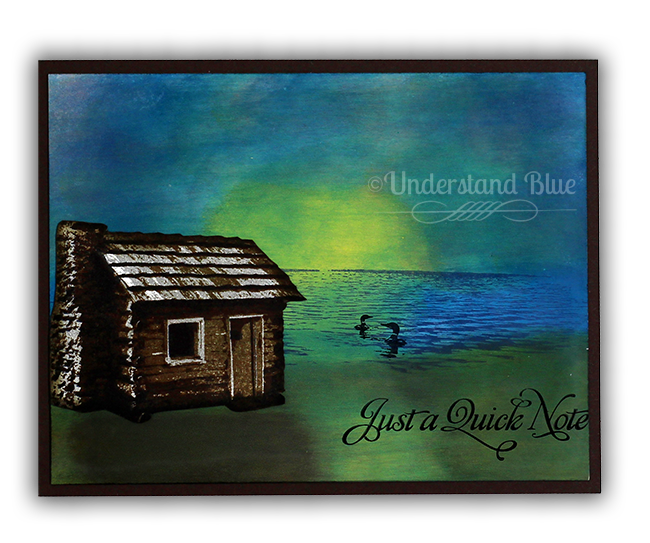 I saw this wonderful card on the Understand Blue blog and just love the moody atmosphere. I'm not familiar with Kitchen Sink Stamps but will have to take a closer look because this is a real beauty. Thanks for sharing your talents with us! Thank you for being a part of this hop ! Wow! Just a fabulous card!!! Thanks for this great chance to win!!! What an awesome creation, off to hop, thanks for sharing! I hadn't heard of Kitchen Sink Stamps before but the stamps and your card look gorgeous! Thanks for introducing them to me!